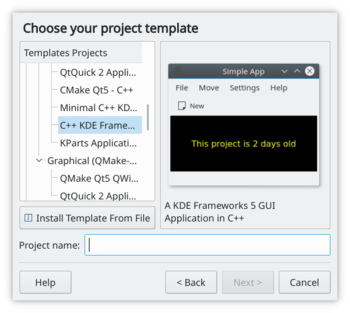 KAppTemplate offers a wizard to make a development project set-up quick and easy. It is supposed to save the time of first time users by performing all steps necessary to create basic forms of e.g. a GUI application program. This page was last modified on 25 January 2019, at 21:22. Content is available under Creative Commons License SA 4.0 unless otherwise noted.